Starches are one of the three main types of carbohydrates. They fall under the category of complex carbohydrates, along with fiber, and are differentiated from the carbs known as "simple sugars" by their structural composition. Good starches are a healthy part of your diet and can be enjoyed by just about everyone. But some starches come from refined carbohydrates and add little nutritive value to your diet. The basic unit of a carbohydrate is a sugar molecule, known as a simple sugar. When they join together forming long chains of these molecules, they are said to be complex carbohydrates, or starches. The dense combination of these molecules in long chains makes it easy for your body to store energy for later use. According to the "Dietary Guidelines for Americans 2010," starches are the main type of carbohydrates Americans consume. Your digestion of starch starts with a process called hydrolysis, or the breaking down of compound through reactions with water. In your case, a special enzyme called ptyalin in your saliva is responsible for breaking down starches into simpler sugars and glucose. Digestion of starch ends in the small intestine. In many cases, however, your body will store some of the energy from the starches you eat as glycogen in your liver and as body fat. This reserved energy can be tapped as your body needs it. Some foods that are naturally starchy include rice, oats, wheat, barley, beans, peas, potatoes and carrots. Natural starches often come from plants that also serve as an excellent source of vitamins, minerals and fiber. Starches can also be refined and added to foods in the manufacturing or cooking process. Cornstarch is an example of a refined starch, as are tortilla chips, potato chips, French fries, biscuits, pastries and desserts. 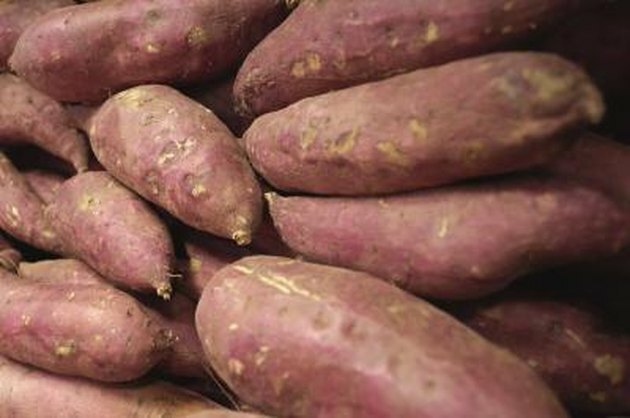 The National Diabetes Information Clearinghouse says that eating starches is healthy for everyone and you should have some starches at each meal. However, you should refrain from starches that have been fried, have a lot of fat and are sugar laden. Both Harvard's Joslin Diabetes Center and the American Diabetes Association say to to use small portion sizes, and that if you choose starchy foods that are also full of fiber, you'll stay fuller longer and not be tempted to overeat. According to USDA, just about all healthy children and adults should get between 45 and 65 percent of their calories from carbohydrates. The guidelines also encourage you to get most of these as complex carbohydrates. Complex carbs take a longer time to digest than simple ones, and they also provide many important vitamins, minerals and fiber. Simple starches and sugars tend to raise blood sugar more quickly, prompting a spike in insulin and quick processing, either as energy, if needed, or as body fat. If you have diabetes, metabolic syndrome or risk factors for heart disease, your carbohydrate intake needs may be different. See your health care provider for more specific guidance.